Fresh fish is harder to come by where this author currently resides in Central Oregon. I should qualify that statement and say that if I was a fisherman, I could have an abundance of fish but unfortunately, I don't fish. Consequently, when the stores have fresh Alaskan salmon, we buy it every week and freeze it for the long draught ahead where we won't be able to purchase it any longer until the next season. That being said, I always have a lot of salmon and we cook it at least once per week. It keeps the freezer recycled and it's good for us at the same time. One day I had thawed out a lovely fillet of salmon but was in the mood for chili as the weather had finally cooled down. Stew, soup or chili just sounded like a good choice. I began brainstorming about white beans and salmon. Just because it was fish didn't mean it couldn't be made into a regular chili dish, right? Lo and behold it can--I did find a couple of recipes on line though surprisingly, there aren't that many for chili made with fresh salmon fillets. Here's my version and what I came up with. It turned out to be spectacular. I paired it with a light beer--Michelob Ultra--cornbread and a green salad. Remove white bones from salmon if any remain, wash briefly, pat dry. 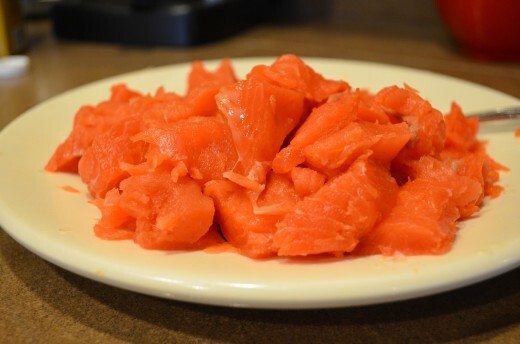 Remove skin from salmon and cut into 3/4-inch chunks. Set aside. Spray large skillet or dutch oven with cooking spray or use a bit of olive oil. 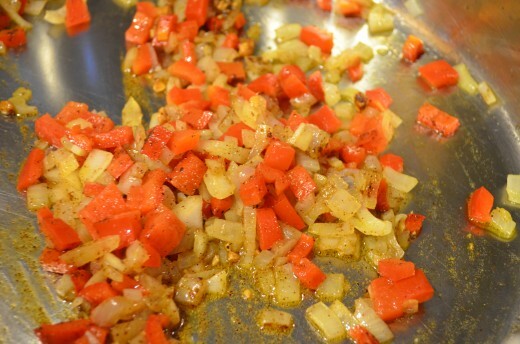 Add garlic, onions and red peppers and sweat a bit until starting to wilt. Add spices. 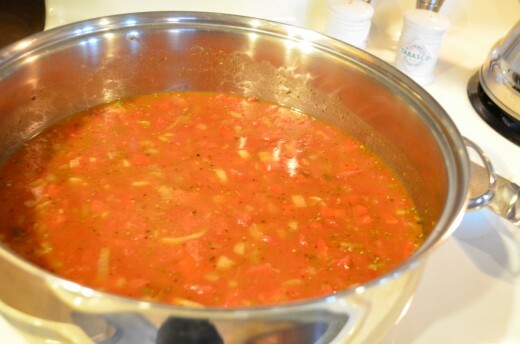 Add broth, diced tomatoes, drained white beans and vinegar. Heat over medium heat until flavors blend and simmer, about 5-7 minutes. Reduce the heat to a very low simmer. 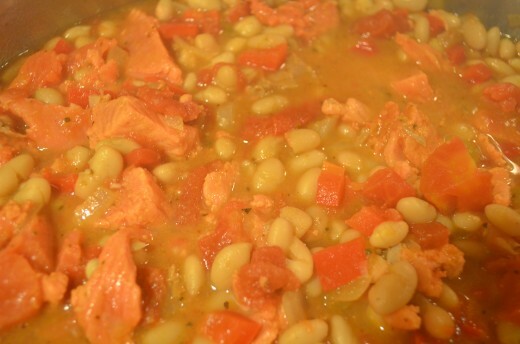 Add chunks of salmon atop the bean mixture. Turn off the heat, cover the pan and let stand for 5-10 minutes. Test the salmon to be sure it is cooked through. It should be light, delicate and melt-in-your mouth tender. Spoon up into bowls. Top with the optional ingredients if desired such as plain yogurt, white cheddar cheese or green onions. Step 2: Sweat or sauté chopped onion and red pepper in cooking spray or a small amount of olive oil until just becoming limp and shiny. Step 4: Add vegetable or chicken broth. 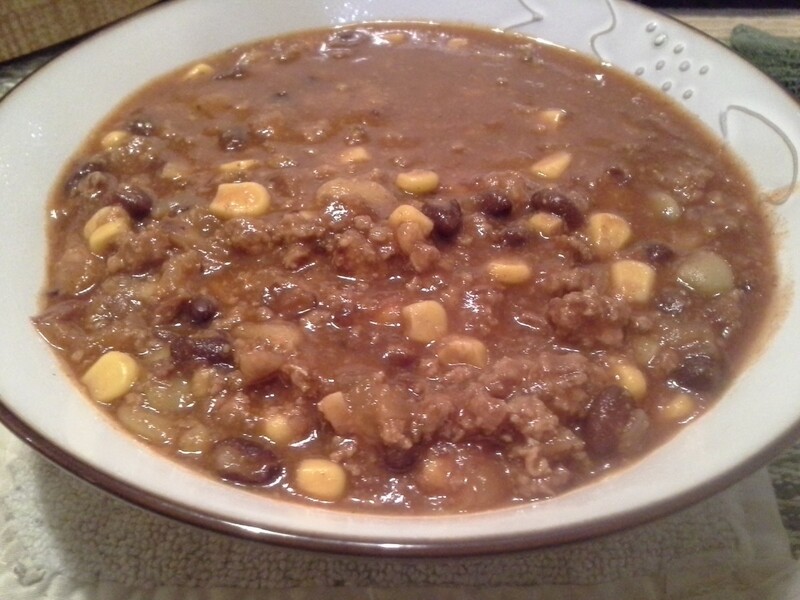 Vegetable broth gives the chili a more red or orange color. 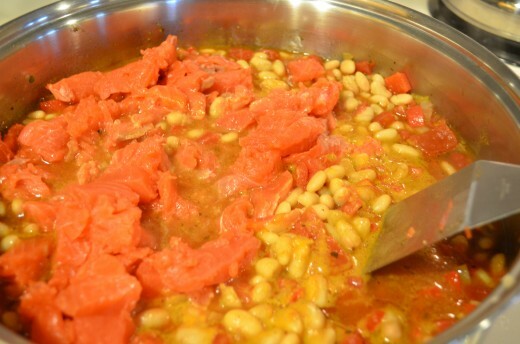 Step 5: Add diced tomatoes and their juice and rinsed, drained white beans. 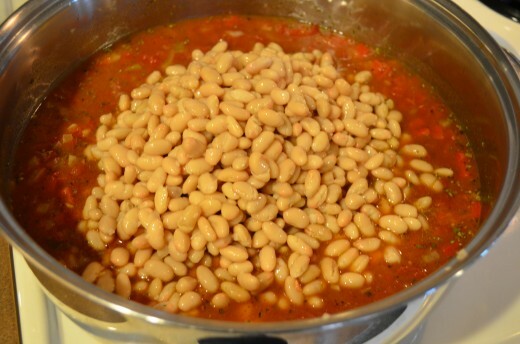 You can also soak and make the beans from scratch rather than using canned. 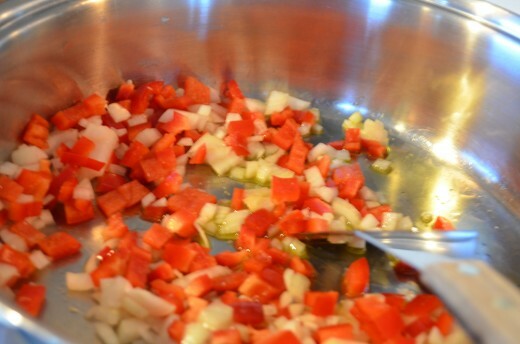 You can also used fresh diced roma tomatoes in their juice (about 3 or so cups). Step 6: After simmering chili for 5-10 minutes to blend flavors and while at a nice slow simmer, add chunks of fresh salmon fillet to the top of the chili mixture. Turn off heat and cover with a lid. Step 7: Allow chili to stand for 10 minutes. Check salmon and make sure it is cooked through. If not, let sit for another 5 minutes. It's very important not to boil the salmon as it will make it tougher. 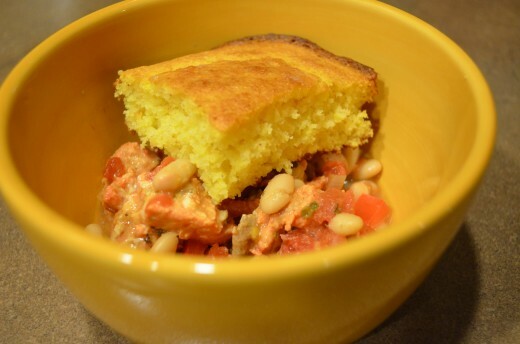 Step 8: Hopefully you remembered to whip up your cornbread and it was in the oven baking while you made your salmon chili. Slice and enjoy with your chili. 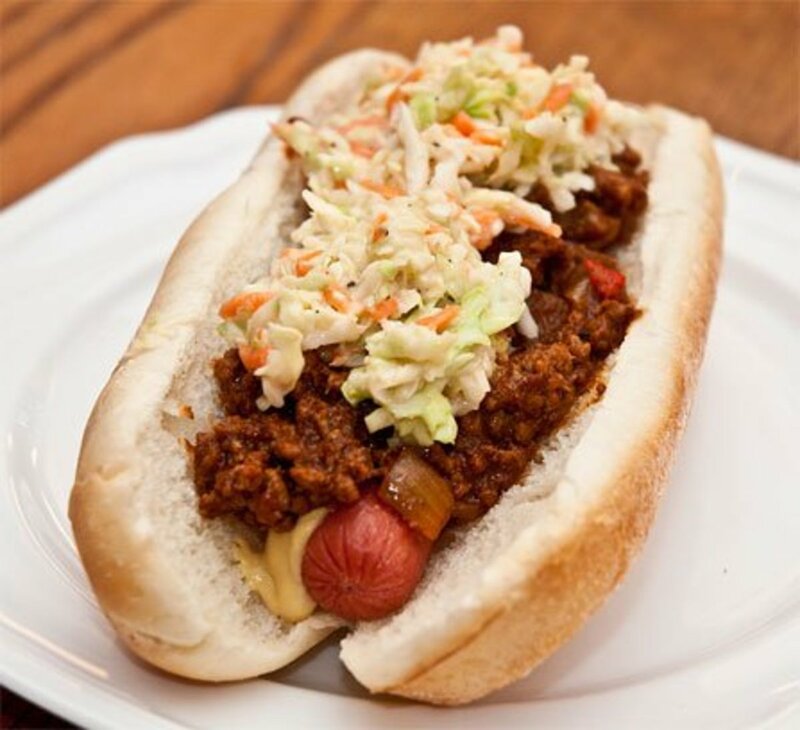 Add a tossed green salad and serve with beer for a great meal any day of the week. Have you ever had fish chili before? Yes and it is fantastic! No but it sure sounds good~~! I think it sounds a little strange but I like fish tacos. I never thought to mix fish with white beans. I might try this! 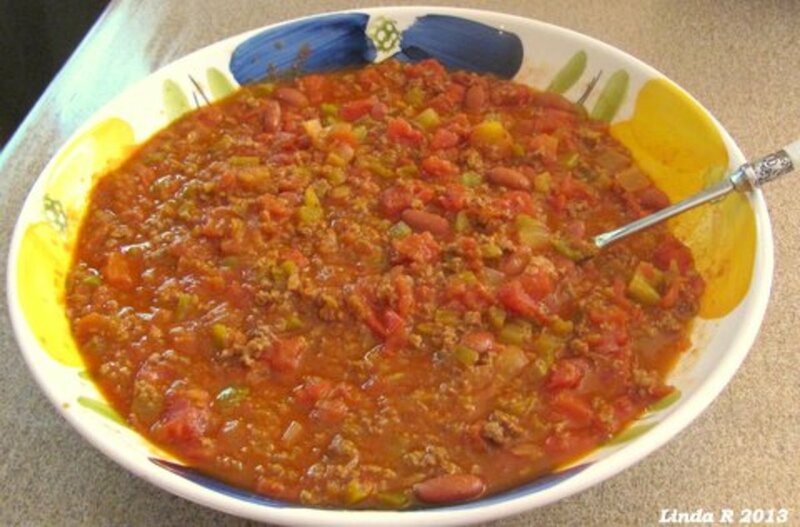 Hi Rebecca--you might just find it's your favorite way to make chili after making it--we did! Thanks for stopping by. Oh my gosh. What a unique recipe. I just love salmon. It is so good for us. It is my favorite fish. Thanks. I will try this. 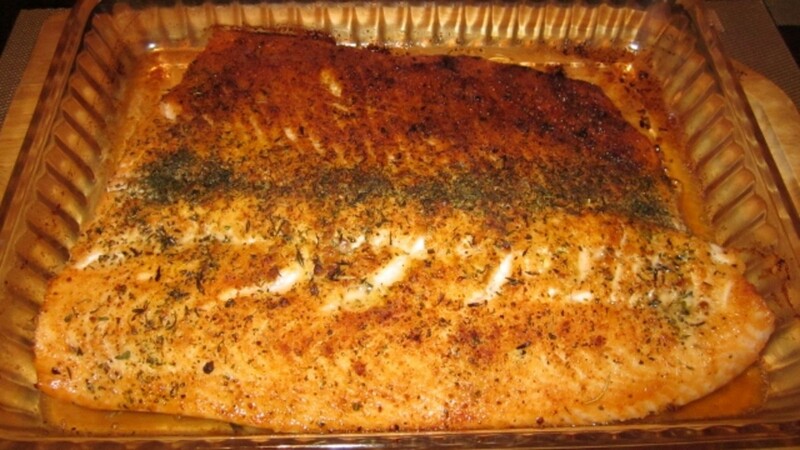 Thanks for stopping by for a "bite" Gail--definitely it was an odd thought I had trying to use some of my salmon but now it's one of our favorites~ I do so much cooking but I'm always looking for something different rather than the same old, same old. It definitely fit the bill! This is definitely a 5 star recipe!!! Those luscious photos actually made my mouth water and I can't wait to try this recipe out. Thanks so much for sharing it. I would never have thought of making chili with salmon. Voted up across the board and sharing. Thanks, Om--I get 2 paws..I mean thumbs up...from the folks I live with. Griffin has recommended me to the Malamute Cook of the Month club as well....he and Gabby actually howl outside when I'm making salmon and they are forbidden in my kitchen! This just looks and sounds soooooo good! I like every ingredient in it, but what makes this chili so alluring to me is absolutely the salmon. You're such a creative chef. Rated up and pinned! Cardisa--and the fish is really good for us too so that makes it even better~ I just love cornbread with chili so it sounded appropriate but probably that isn't as healthy~ Although it is made from scratch so better for you I suppose than out of a box. Thanks so much for stopping by. 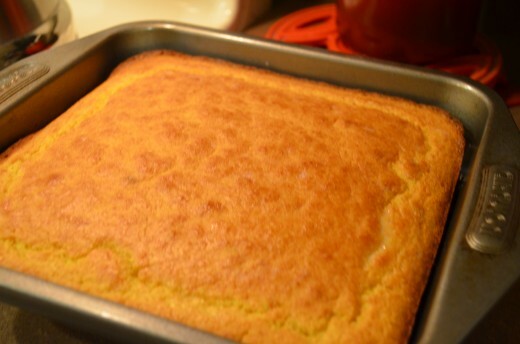 Your cornbread looks absolutely delicious! I must also say I would never have thought to use fish in a chili! This is totally original and looks absolutely mouthwatering. 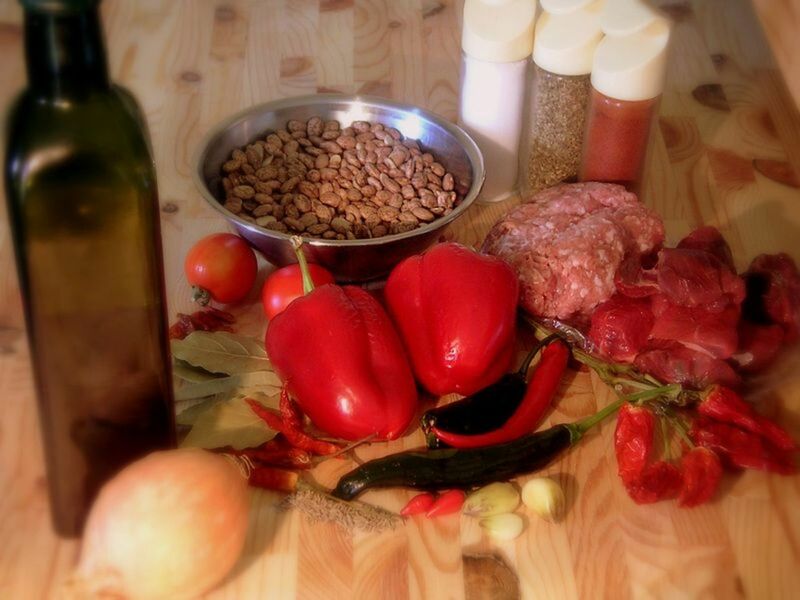 Great recipe for a winter evening dinner. Thanks DDE~ It does taste fabulous!